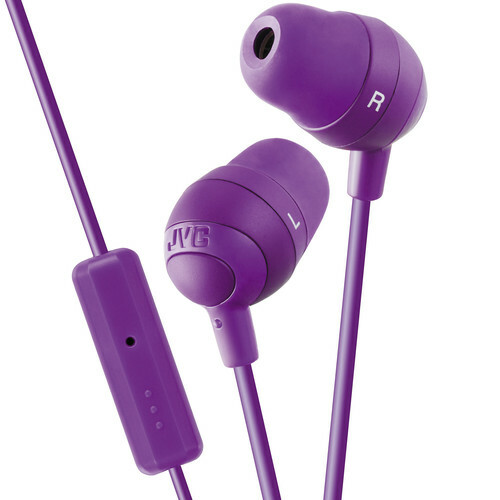 The violet HA-FR37 Marshmallow Inner-Ear Headphones from JVC feature 11mm Neodymium drivers and an in-line 1-button remote and microphone. Their memory foam earpieces help provide sound isolation as well as a secure fit. Box Dimensions (LxWxH) 7.1 x 2.6 x 1.0"
HA-FR37 Marshmallow Inner-Ear Headphones (Violet) is rated 4.0 out of 5 by 13. Rated 4 out of 5 by Garty from Surprisingly good, for the price I initially wanted to get a pair of cheap earbuds for school, so I could leave my pair of Bose headphones at home. I'm actually quite impressed at the quality of the sound. The bass is amazing, and barely seems to drown out other elements of the song, but as a bass lover, this doesn't bother me. My only concern is that they're not very durable, and are a bit uncomfortable to wear after long periods of time... However, I think these are worthwhile for the price of only $. Rated 5 out of 5 by Putchka from Sounds good It sounds pretty good for the price. The only drawback is that its a straight jack and not an L-Shape, which is always a minus in my book. Rated 3 out of 5 by Athena from Too big for my ears The sound is fine, but the diameter of the in-ear piece is too wide to fit comfortably into my admittedly small ear canals. This comes with variably-sized foam sleeves, but the technical core just is what it is, so there's only so small it can get. The memory foam cannot expand properly, and the device falls out. I suspect that few adults will have this problem, though. Rated 4 out of 5 by tomasmoves from Really good sound and noise cancellation Since I go through headphones like water because I'm so rough I usually for for inexpensive sets that usually dont fit the best or have sound limitations. Not only do these sound good but the marshmallow ear buds fit like ear plugs so that they form to your earhole being more secure and canceling lots of outside noise. Great deal! Rated 5 out of 5 by dabe from Awesome Consistently my choice for affordable IEMs. Foam helps them stay in your ears much better than other brands, and sound quality is pretty decent too!. Best value for the money. Rated 4 out of 5 by Deaths from Cozy Bought these to sleep in, really really comfortable. Didnt buy them for sound or bass or to use my cell on just to watch movies on my ipad with my wife next to me. Ive slept in them every night since i bought them and no ear hole pain. Rated 3 out of 5 by Shu from Strange fit. Good sound block. It blocks outside sound very well, but for some reason they don't fit my ears very well and often fall out. The part that goes into the ear is made of dry foam(not the squishy silicon kind.) Anyway they are great deal.